Own the only Laundromat in a Small Town! This business has been a staple in Selma, NC for over a dozen years. 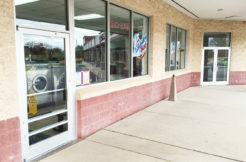 Located on Pollock Street, the Selma Laundromat sit right in the center of town with “main street” traffic and excellent demographics to support a coin-op laundromat. Selma is a blue collar town with almost no other laundromats in the immediate vicinity. – Premium location on a major thoroughfare in Selma, NC. Facilities: Equipment List: 5 x 40 LB Continental washers 10 x 30 LB Continental washers 7 x 18 LB Continental washers 13 Whirlpool top loaders washers 48 Stack dryers Change Machine New HVAC and Roof installed in 2018! Competition: The current owner does little to no marketing and has been running it absentee; there is ample opportunity to grow the business.